Being a person who loves all the glitz and glamour of the theatre I have to confess that I have very little experience of ballet, so would be foolish in this review to try and focus on the moves and lifts of a ballet dancer, but simply describe what I saw as a novice to this elegant world. Of course I had the stereotypical idea in my head what the dancers would look like and would be wearing for a ballet. I had read that Matthew Bourne was an extremely versatile and talented choreographer with 30 years experience behind him, with a vast amount of awards and nominations for his work. So I can say I was a little intrigued to see what all the fuss was about, but had absolutely no idea what I was about to see. It was quite obvious his production of Cinderella was popular as I couldn’t see a single empty seat in the auditorium and tickets for the 5 day run were almost sold out. So the classic fairy-tale of Cinderella I remember being a poor young girl who is mistreated by her evil stepmother and stepsisters, they won’t let her go to the royal ball, but with the help of her fairy godmother she goes anyway, falls in love with the Prince, leaves at midnight, the Prince tracks her down using the glass slipper she accidentally left, and they live happily ever after. So I knew the drill… or did I? The front-drop was a famous picture post photograph of St. Paul’s lit by searchlights and the burning city where there is an enormous glittery shoe lying in the rubble (not the Cinderella I remember). The curtain went up to sirens blaring and low-flying bombers roar loudly overhead and I was faced with a scene of war torn London in 1940 (definitely not the traditional fairy-tale in mind). I believe the inspiration to do this came from his knowledge that Prokofiev’s score had been written during World War 2 (genius). His work clearly focuses on attention to detail as in the opening scene Cinderella (played by Ashley Shaw) is surrounded by her stepfamily in the blacked-out family home where the set design was perfect in illustrating a wealthy home dampened by war. Everyone’s costumes were grey and drab colours indicating the mood of this terrible era. Her father Robert (Alan Vincent) was sat to one side in a wheelchair without emotion and disengaged, staring into a dim fire. Around her the mean and spiteful members of the family are excited by the arrival of invitations to a party at the Café de Paris. They are handed to each family member by her wicked stepmother (Anjali Mehra) and true to form an invitation is not given to Cinderella. Interesting Cinderella’s ‘Prince’ is Harry (Will Bozier), with more than a coincidence his name is that of a British Royal. He is an injured and traumatised RAF pilot who stumbles into Cinderella's life, but is lost again amid the chaos of an air raid. 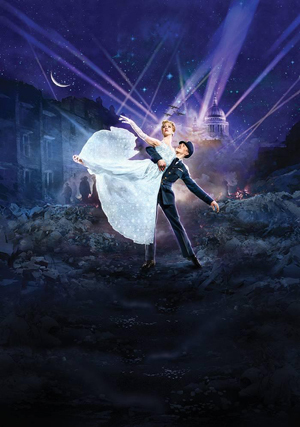 There is no Buttons in Matthew Bourne’s version of Cinderella and there is no Fairy Godmother either. Instead there is an Angel (Liam Mower), a much more interesting and modern character. Thanks to the angel, Cinderella does get to the ball, and using the Cafe De Paris as the venue is an interesting and poignant choice of Bourne. This is the Café famously documented for receiving a direct hit from a bomb in 1941, where the crowded club was destroyed and devastated with a huge number of casualties. Of course Cinderella gets her man in the end but it isn’t quite the ending I was used to from my childhood. How much the couple are traumatised by their wartime experiences and how much is dream or reality isn’t quite clear. Prokofiev’s original score although written for a romantic ballet, hints at darkness throughout, and Bourne uses this edgy side to the music by repeatedly pointing to the dangers and tragedies that swarm around Cinderella and her Pilot. Clever use of costumes and set design by Lez Brotherston, makes it easier for the novice to spot the difference and understand the story of happiness, or the sadness in the silent version of Cinderella - the use of a projector displaying war scenes etc was another modern and interpretive element to the production. There wasn’t a Tutu, leotard or pair of tights to be seen in this ballet but the audience did see stunning, elegant costumes from the 1940’s decade with glittery shoes. The female dancers oozed grace as they were lifted effortlessly from the males who rippled with strength and control. As a novice of ballet, I feel that I am not in a position to say if it was a brilliant ballet with perfect moves, but what I can say is that I did witness pure elegance and enchantment. I was particularly enchanted by the scene which sees Cinderella dreaming of meeting her pilot again and dancing with him where she uses a mannequin to emulate her beloved Harry. In summary I enjoyed Cinderella. However would I go again to the ballet is another question, I think I will leave it to the experts and ballet lovers.